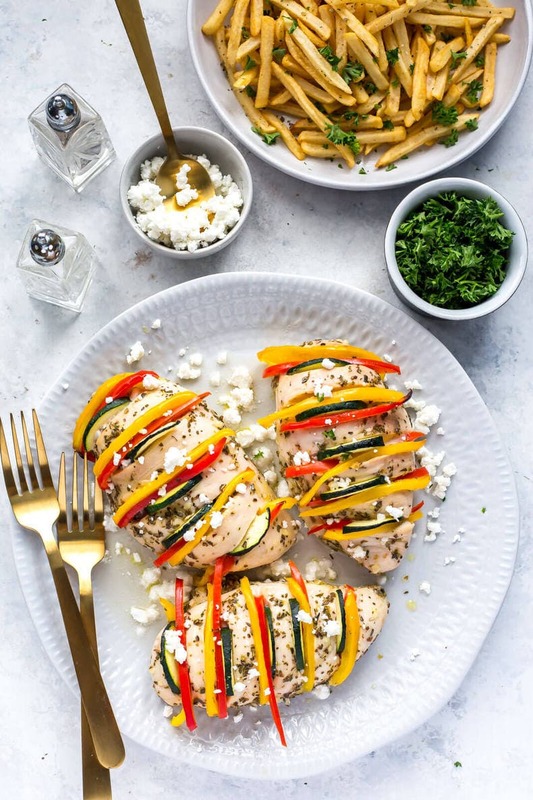 This Baked Hasselback Greek Chicken is baked in an easy lemon-oregano marinade and stuffed with bell peppers and zucchini then topped with feta – it's a deliciously healthy and easy dinner idea ready in less than 45 minutes! 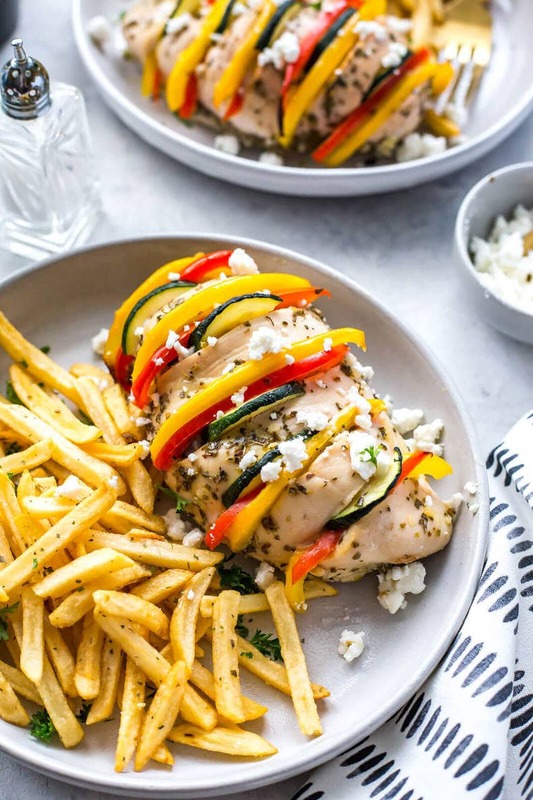 Say hello to colour and good vibes with this Baked Hasselback Greek Chicken! I was gonna cook this on the grill but decided against it at the last minute because I think this chicken is just so delicious it needs to be enjoyed year round, and that's hard to do with a BBQ. 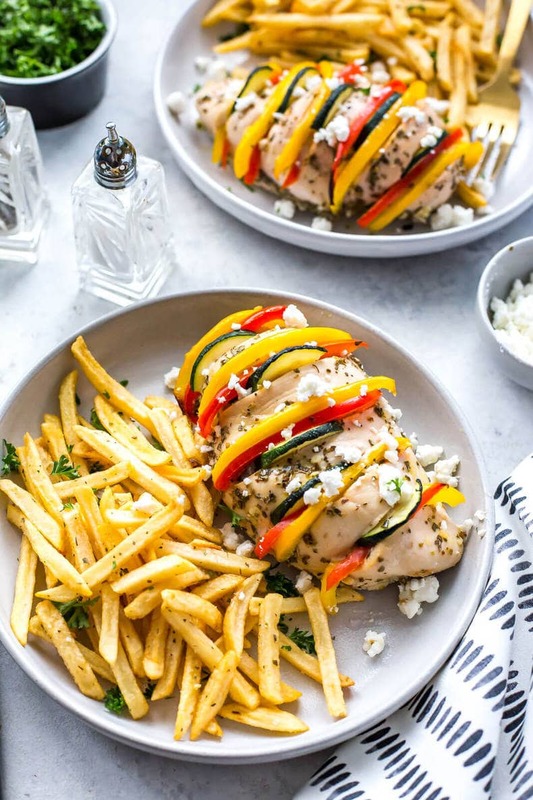 Like my Hasselback Fajita Stuffed Chicken, this Greek chicken version is exploding with flavour and SO EASY to make! Once you've got the chicken done, it's just a matter of adding an easy side dish (I did oven fries but you could do a Greek salad or baby potatoes) and then going to town. And forgive me, but I actually forgot the tzatziki here!!! 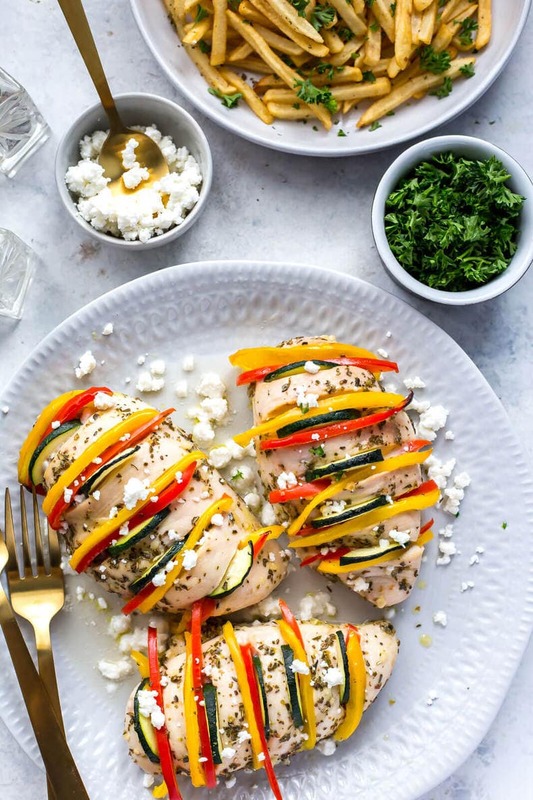 You can never have Greek chicken without tzatziki or hummus, just like with these Chicken Souvlaki Meal Prep Bowls! For this Baked Hasselback Greek Chicken, I basically just used the basic Greek chicken marinade that I keep on hand for busy weeknights. 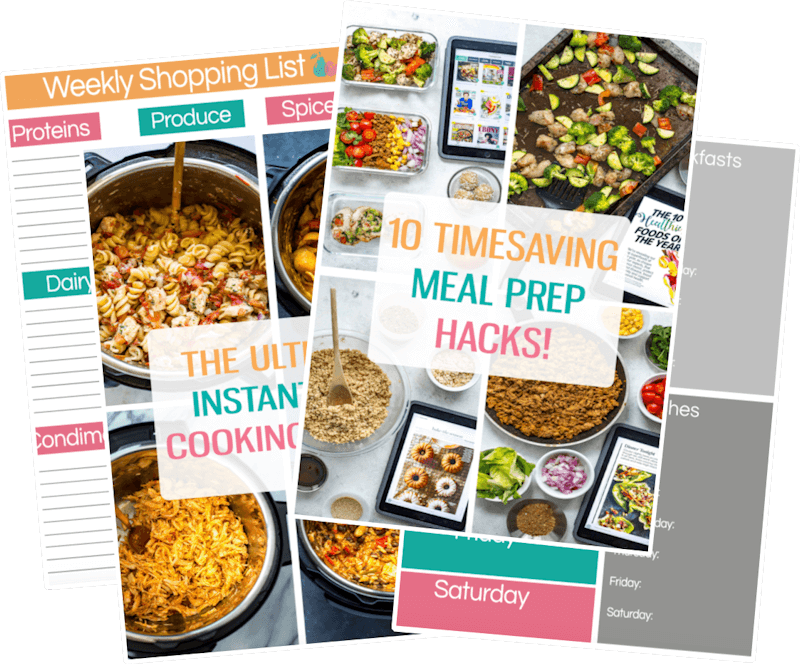 It's so easy to throw together and uses mostly pantry staples so you don't have to worry about making a last minute trip to the store or anything. It's basically just a mix of olive oil, lemon juice, minced garlic (fresh or the jarred kind works), oregano and a pinch of salt. Easy right?! 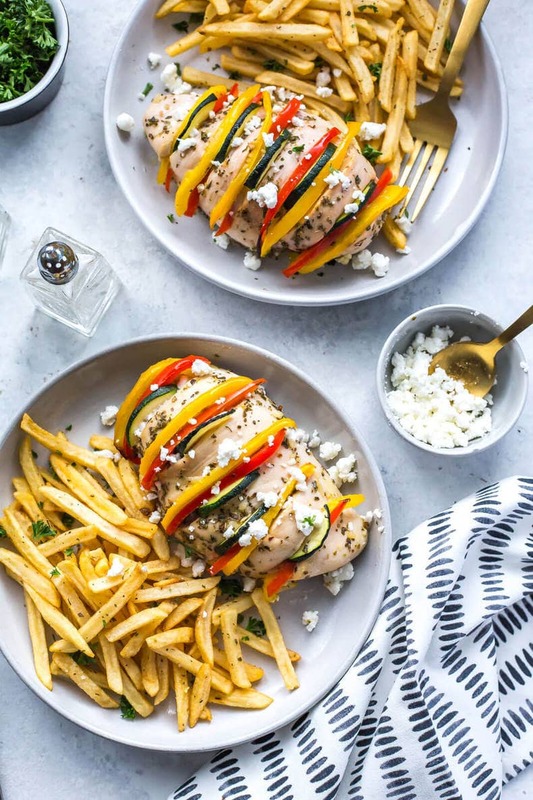 I swear, you'll be using this Greek chicken marinade on everything! And I feel like you could also probably switch out the oregano for another fresh herb or spice like chili powder, paprika, cilantro or parsley. Sooooo basic but so good! 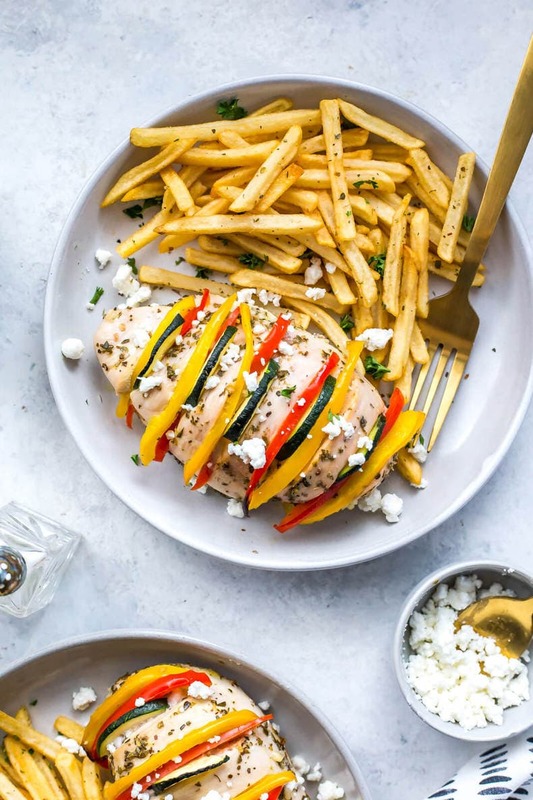 Now for this Baked Hasselback Greek Chicken to come together, you're going to need to do a bit of coordinating on the cooking time of your side dish, but if you're just making the chicken alone, the method is pretty easy. One thing you really do need to get right with hasselback chicken is making deep enough cuts. Shallow cuts won't allow your chicken breasts to hold all the veggies, and since they're the star of the show you need to be able to fit a bunch of them. Once you've got your cuts, it's time to marinate the chicken in a small baking dish for 15 minutes. During this time I'll usually cut the veggies, and then the chicken is ready to be stuffed. Don't overfill each cut, you just want one slice of each veggie in each cut. From there, it's just a matter of baking in the oven for 30 minutes. 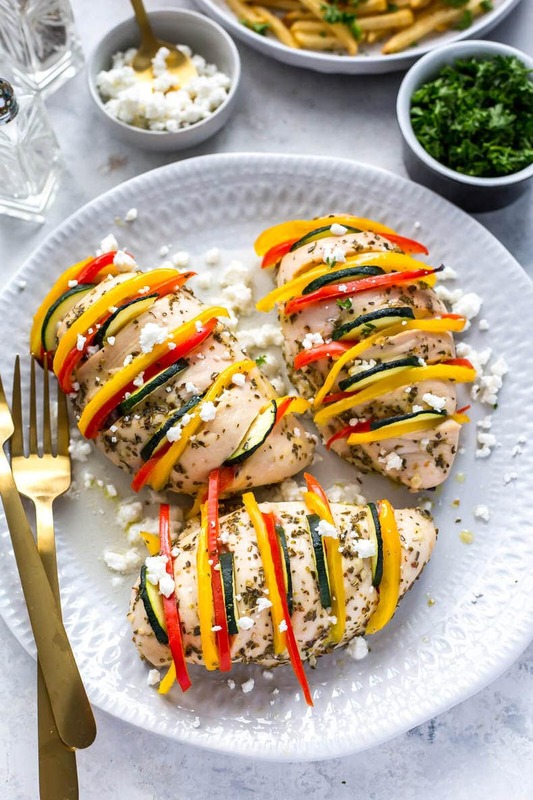 You're also going to want to ensure that you're slicing the bell peppers and zucchini thin enough so that they can be stuffed inside the little cuts in the chicken. I tried to get 1/4-inch thickness on all the veggies and then stuffed them in there. Don't worry if some of them are sticking out of the chicken a bit, as long as they are tucked inside and aren't falling out you're good to go! 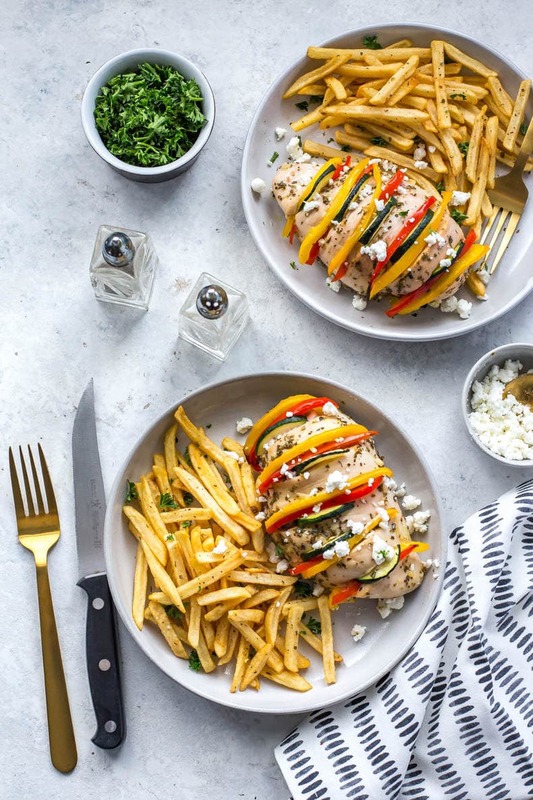 One of the key benefits to this Baked Hasselback Greek Chicken is that the veggies don't get overcooked by being in the oven too long because they are cooking alongside the chicken at the same time. And everything stays moist so you have delicious, flavourful chicken breasts that are just as appetizing to look at as they are to eat! Come on now, we all know presentation is key! Top your Baked Hasselback Greek Chicken with a little bit of feta, and some freshly chopped parsley if you have some on hand and you've pretty much got the best dinner ever! 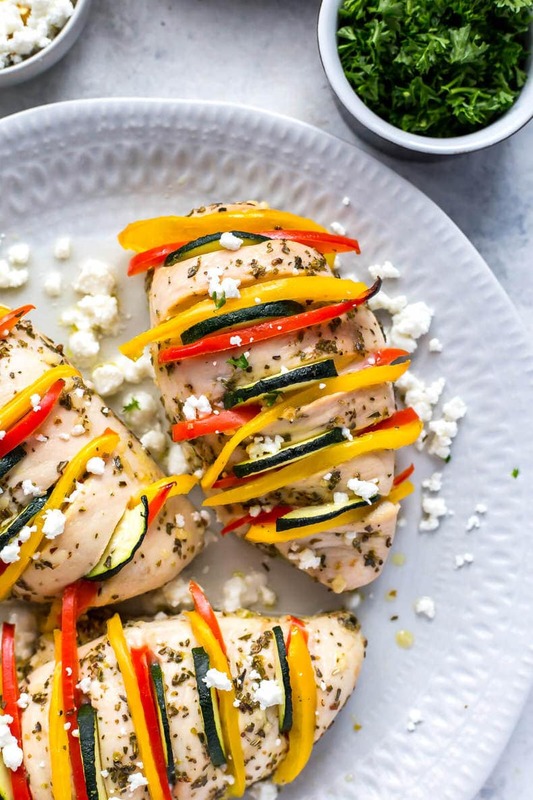 Will you be making this Baked Hasselback Greek Chicken? 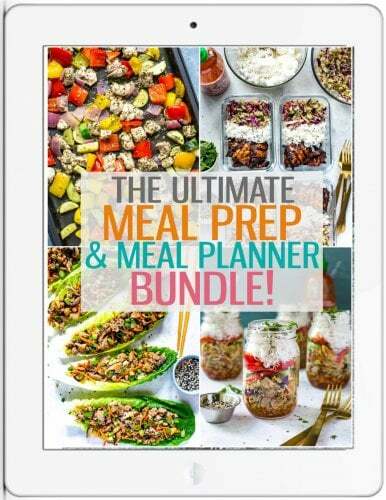 I promise this is going to become a go-to staple on your dinner menu each week, and it's so healthy and delicious too! Those are the best kind of dinners right?! 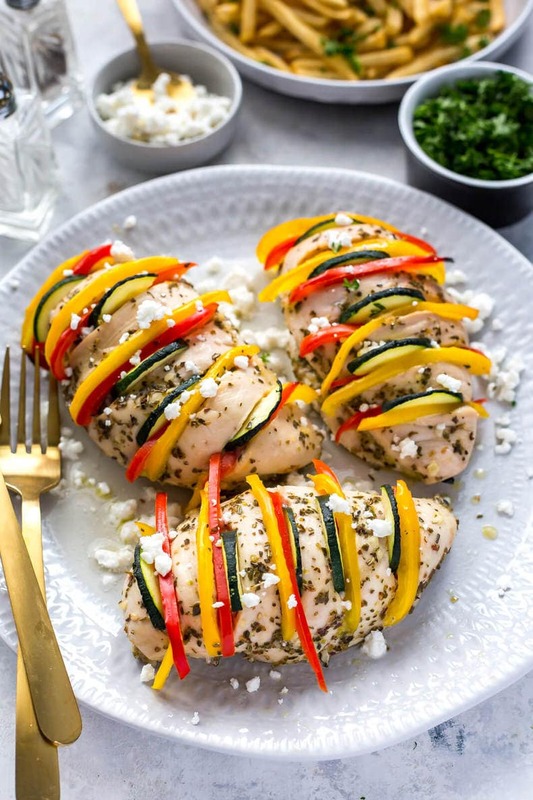 This Baked Hasselback Greek Chicken is baked in an easy lemon-oregano marinade and stuffed with bell peppers and zucchini then topped with feta - it's a deliciously healthy and easy dinner idea ready in less than 45 minutes! Preheat oven to 425 F. Make horizontal cuts across each chicken breast (see video if you're unsure how!) and place in a small oven-safe dish. Add olive oil, lemon juice, garlic, oregano and salt, tossing chicken breasts to coat. Marinate 15 minutes. Meanwhile, prepare veggies. Stuff in each chicken breast (you can do so while chicken is still marinating) and then bake for 30-35 minutes in the oven or until chicken is fully cooked. Remove from oven, top with feta cheese then serve with oven fries, baby potatoes, salad or some other sort of side dish and enjoy!